The Mediterranean diet is a UNESCO recognized diet which includes the traditional dietary patterns of Greece, Spain, southern Italy and parts of the Middle East . This diet is generalized by high olive oil consumption, high consumption of legumes , high consumption of unrefined cereals , high consumption of fruits , high consumption of vegetables , moderate consumption of dairy products (mostly as cheese and yogurt), moderate to high consumption of fish, low consumption of meat and meat products, and moderate wine consumption. 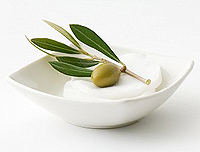 Olive oil is particularly characteristic of the Mediterranean diet with many beneficial side effects. It is low in saturated fat, but contains a very high level of monounsaturated fats, most notably oleic acid , which epidemiological studies suggest may be linked to a reduction in coronary heart disease risk. Lower incidence of heart disease is associated with the Mediterranean diet . Olive oil also contains at least four different antioxidants, which can help neutralize damaging free radicals that can lead to skin aging and skin cancer. 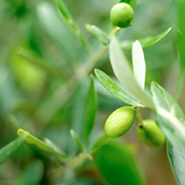 There is also evidence that the antioxidants in olive oil lowers total cholesterol and LDL levels in the blood. It is also known to lower blood sugar levels and blood pressure. The benefits of olive oil have been attributed to so many things from combating depression to preventing cancer, but in Greece olive oil and the Mediterranean diet is just a way of life. Daily exercise includes, walking or riding a bike to the fresh fruit and vegetable market to buy in-season products, then on to the fish market or the butcher shop for fresh protein. Finally a stop at the bakery completes the meal. Greeks will eat their main meal at lunchtime (around 2pm) and then have a light dinner, like a salad, in the evening. This decision was announced November 1, 2004, by the Food and Drug Administration after application was made to the FDA by producers. Similar labels are permitted for foods rich in omega-3 fatty acids such as walnuts and hemp seed.